Below are our recommended, nice, quiet, off-the-beaten-path places to stay along our boat tours between El Nido and Coron. The below table lists our recommended accommodations from El Nido to Coron (going south to north) as shown approximately in the map to the left, starting with a beach hopping tour from El Nido along the north peninsula, then launching the boat tour from the archeological village of Sibaltan. On our private custom boat tours you are welcome to go any direction you like. 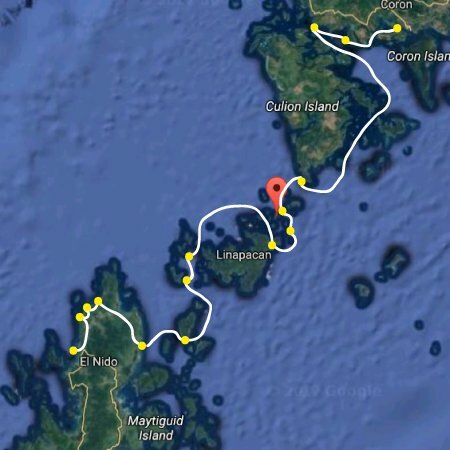 Note that the total trip between Sibaltan and Coron is about 7-10.5 hours (depending on the size of the waves), so too long to do in only one day (if you want to stop and see any of the sites), but short enough to dillydally your way on a multi-day tour (the average and ideal is 4-5 days). Generally the boatman can arrange basic accommodation for you (usually around 500p/person), but if you want something fancy or special you can reserve it yourself below. You can sleep on the boat for free, otherwise sleeping on land is extra and is charged separately. If sleeping in a tent provided by the boatman (who generally also has mattresses, pillows and sheets), the charge is usually 500p/night/tent. All or most of the beaches now generally charge 100-300p entry fee. 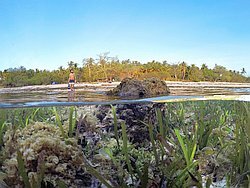 You can check out our suggested itinerary for other places in the Palawan area. A next to the resort name refers to the number of our own customers who highly rated this place. Located on a beautiful beach about 3km out of town, under the famous zipline taking you from the mainland to a nearby island. At the end of the zipline you can pay extra to take you right back to your hotel, or walk down the rickety rackety bamboo stairs and across the thin peninsula to a beach restaurant with extraordinary view. 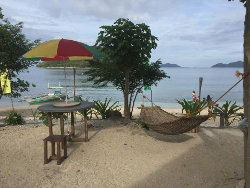 You can check out things to do in town on our El Nido page (with more budget accommodation), but generally we recommend only one night in this town because it is overcrowded with tourists, as are its lagoons - a better place for that might be Coron. Second price in dropdown menu below is low season from June to Dec.) - includes breakfast and taxes. First of the places along the nicely secluded Nacpan Beach. Tend to take reservations through facebook only. Prices include breakfast. The other small beach at the end of Nacpan where the island is, but located close to Nacpan, which is why they like to say they offer twin beaches. 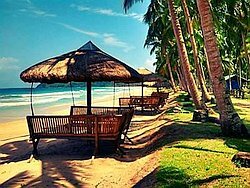 The first and only establishment that offers accommodation on Duli Beach (still on the El Nido peninsula but a little bit further up the coast). This 2 km long beach is picture perfect; it has clear blue water, wide white sandy beach, many palm trees, jungle backed, rocky parts on the side, six months per year good waves and is pretty much secluded. The price for our bungalow is PHP 2500/N. We allow children that can stay in separate bedding for an extra fee of php 500 per pax per night. Normally we can accommodate 3 pax in one bungalow, but depending in the ages of the children we can make it accommodation for 4. 5/5 of 41 reviews on Tripadvisor. Sibaltan is a wonderful archeological village (where we mostly end or start our tours) established by the Cuyonin people from the kitesurfing island of Cuyo after they realised they need more land to grow rice. More details on the town here, any of the places along the long stretch of beach highly recommended. 30% discount rates from May to November. Breakfast included, prices converted from dollar amounts as posted on their site. If you don't want to deal with the hassle of booking accommodation yourself and are happy with the basics, such as small huts or tents, you can let the boatmen organize it all for you. You will be able to communicate with them via Facebook in advance for such matters, including any special dietary requirements if you have them. Now that you launched your boat tour from Sibaltan, make sure to stop at the first beautiful island only 30 minutes away! A must see with its long beautiful beach in a charming rural setting where all the children will run up to you for attention. The captain regularly sends the local fish and squid catch to Manila, and he loves to cook, so expect fantastic cuisine. Lots of little islands and snorkeling to explore in the area, an easy place to get stuck in! All rooms with fan 24/7. A little bit off the pier, which you can find in this info of the town, but in a quiet area and a nice hotel with spacious rooms and air conditioning if needed (extra charges may apply). Not much to see in this town, but a good base to explore the surrounding area with local boat trips (we can organise for you) if you need the comfort of a hotel. Two rooms with double beds (more mattresses can be put on floor) and one room with two bunkbeds. A big dormatory is under construction with about 10 bunkbeds. All rooms have aircon and fans and the hotel has its own generator. 4/5 of 4 reviews on Tripadvisor. More info..
4.5/5 of 6 reviews on Tripadvisor. 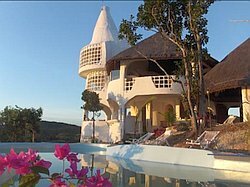 A new addition and highly recommended by one of our guests, located on the island of Linapacan, west side. Can email to Julius Moncatar at [email protected], discount available for groups over 15. 5/5 of 6 reviews on Tripadvisor. More info at booking.com and facebook. A project I started but no longer manage. More info here. Can be good for kitesurfing if you have your own gear. Raw nature, definitely off the beaten path. Some smaller huts next to the big hut have been built since I left. Since I left I received one complaint that it is overpriced and service not good. 5/5 of 8 reviews on Tripadvisor. Website. 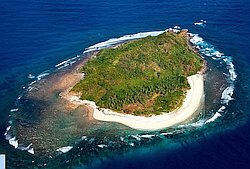 There are many to choose from, as well as deserted beaches on sparsely populated islands, such as Bolina Island in Linapacan, or Calacala or Takling islands on the way to Sibaltan. You can camp out with the boat crew, or they can leave you to yourselves if on Bolina (if they live in Linapacan), setting you up for cooking dinner on the fire and tent(s). Subject to availability, as the islands may be used by others. Generally 300p/tent or 400p if 2 people in tent, plus the caretaker may come by and ask for 100p each. One of my favourite boat tour spots, but you can also stay overnight, either in the usual tent or in their guest hut. Very small and friendly little village, with its own store, and they'd be excited to fire up their videoke and party with you. About 40 minutes past our Patoyo Nature Camp, which is about 40 minutes past San Miguel towards Coron. Usual prices apply as with deserted islands. No need to book but just show up. May require a minimum of three nights stay. 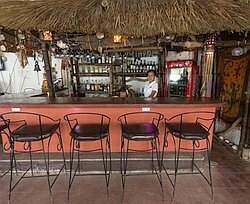 Inclusions : Accommodation; Airport pick up ( car and boat ); Fun activities : snorkeling, stand up paddling; breakfast, lunch, dinner, apero; selected local beers and spirits. Managed together with 250k kiteboarding during the kitesurfing season. A mighty fancy place as you first enter the Coron area. They also offer diving. Rates (high season/low) include breakfast for 2. Additional person 0-7 years old free of charge, 7-12 yrs extra 750p, 13 yrs and older 1300p. Standard cottage can accommodate 3, the villa 4 (although the bed in the pavillion is outside). A real lighthouse resort, very stylish, offering fantastic sunsets as it overlooks D'Pearl Bay, the same as Puerto Del Sol above. Offers a floating bungalow for sea-gypsies at heart. Rates do not include 12% tax, breakfast is included. Rates shown in succession for low season (June to end September), main season Oct. to June, peak prices from Dec.17-Jan.6, Jan.23-Feb.3, Apr.9-21. Minimum stay two nights. Check out their website for other suites. 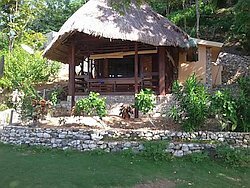 4.5/5 out of 163 reviews, #1 of 65 B&Bs and inns in Coron according to Tripadvisor. 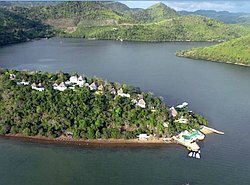 Part of the same complex as the above two, in the beautiful bay of Busuanga, not far from Coron. Includes breakfast, roundtrip airport pickup and dropoff, taxes and service charge, if you book at least two night. If you book only one night, 1,000p/person for the airport transport, or organise something yourself. Prices the same year round. 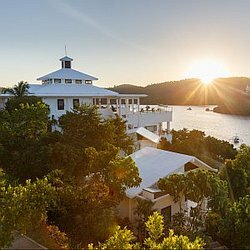 Eleven historic World War II ship wrecks just minutes from their beachfront, native-styled guest accommodations. 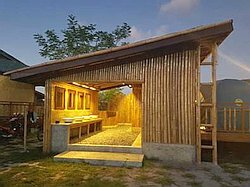 Each accommodation is well ventilated and includes mosquito-netted windows, spacious western-styled bathroom facilities, ceiling fans, ample lighting, and 220-volt electrical outlets. All accommodation rates reflect per-person, per-day/night double occupancy (twin share), and include: three buffet meals per day, complementary coffee/tea and transfers to and from Busuanga airport. Price are in USD for low season (Jun16-Sep30), high (Oct1-Jun15) and peak. Shows maximum occupancy of each (number of parents + number of children). 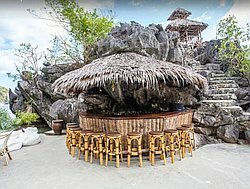 Website, reservations and rate details. If you want to be closer to Coron but still have peace and tranquility, this place is for you. It has its own pier and is a nice place to start and end your tour. All our modern resort rooms and some cottages can accommodate 3 people and we add P400 for the extra bed. Our family native cottages offer 3 beds at P3000 and 4 beds at P3,400 per night. 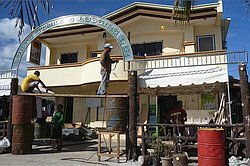 MDI Divers (formerly Discovery Divers) has been operating in Coron for over 20 years, is the most experienced dive school on the wrecks and is the only dive operator offering technical diver instruction. Prices do not include 12% tax. Website, check availability at booking.com. Instructions: Guests have been rarely using this so I have stopped with the programming keepup and not all places will calculate in the sum below. To the left of each place above you will find two fields: the top one is for how many nights you want to stay at that place, and the field directly underneath it is the price per night. You can use the dropdown menus found in some of the places to give you an idea (prices may be an approximation) what the total nightly rate will be for your group. You will need to contact the places yourself to determine if they have availability for the rooms of your choice. Once you have made your selection, press the Submit and Calculate Price button below to show you the total (the grey cells to the left will turn green for those places you have selected). If you have just completed the boat tour booking process, your Booking ID should already be filled in for you. If you have filled in the boat tour booking process previously and have come back to this page later in order to arrange your accommodation, simply enter the Booking ID provided at the bottom of the email sent to you on completion of the booking form. For security reasons you will also need to enter the email address you submitted during the booking process. On completion of this webpage, your chosen accommodation and boat tour spots will be added to your record and which you will be able to print out to show your boatman so that he knows where exactly you want to go. Another option is simply to let your boatman decide which spots to visit and where to stay based on your preferences when you meet each other.